This entry was posted in holster, light/laser, pistol, self-defense, weapon and tagged 45ACP, M1911, pants, Viridian, X5L. Bookmark the permalink. 9 Responses to Is That a Gun in Your Pocket? It’ll be kind of subjective, but how well made and durable are they otherwise? I think I’ve seen these before. Don’t you need to do a little chickenwing-shrug sort of move to break the pocket open? I’d like to see them with additional pockets. I don’t like to sit on anything and I don’t like anything on my belt, so I stuff everything in my front pockets. Their website says to draw the gun you pull up and *out*. Doesn’t that mean you laser your thigh each time you pop the snaps? Maybe, but why does that matter? The laser won’t hurt you. “Laser” is slang for ‘point the muzzle at’. 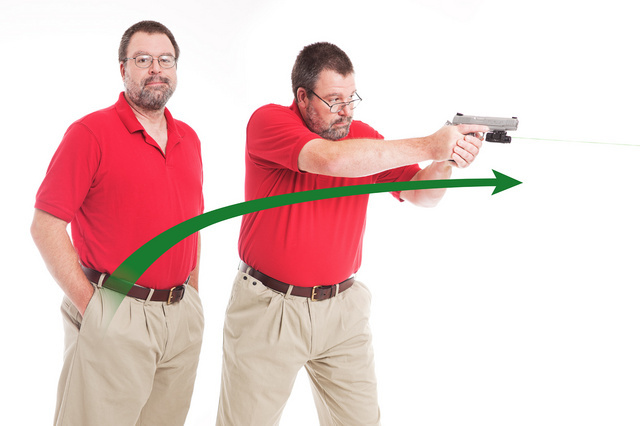 A good draw from a holster should never end up pointing the barrel at any part of your body at any time. Yes you do laser your thigh and potentially other nether regions. I watched the product video’s on their website. So you’d best utilize good trigger discipline or you could end up shooting your femoral artery or castrating yourself. You can draw easily with the gun pointed slightly forward, not at your own thigh.